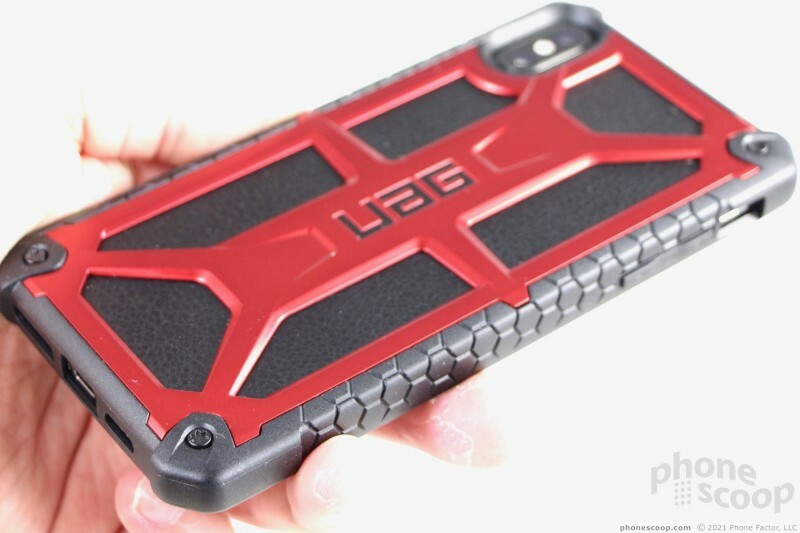 Urban Armor Gear (UAG) makes a broad range of protective cases for today's top smartphones. 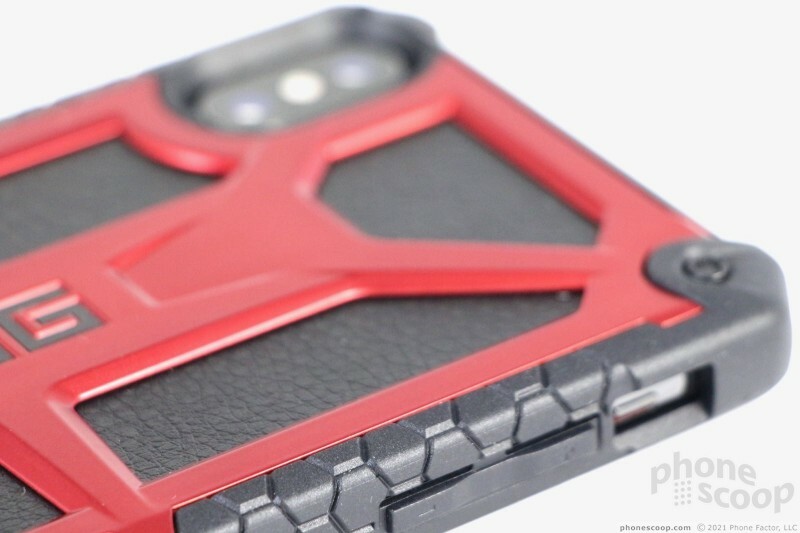 The UAG Plyo, Pathfinder, and Monarch Series (for the Apple iPhone Xs Max) span from simple to industrial, and offer a high degree of protection. If your $1,100 iPhone Xs Max kisses the sidewalk and shatters, it's going to hurt your wallet a lot more than your pride. Repairs for broken iPhone glass are pricey, even with AppleCare+. It's far less expensive to wrap your phone in a case. 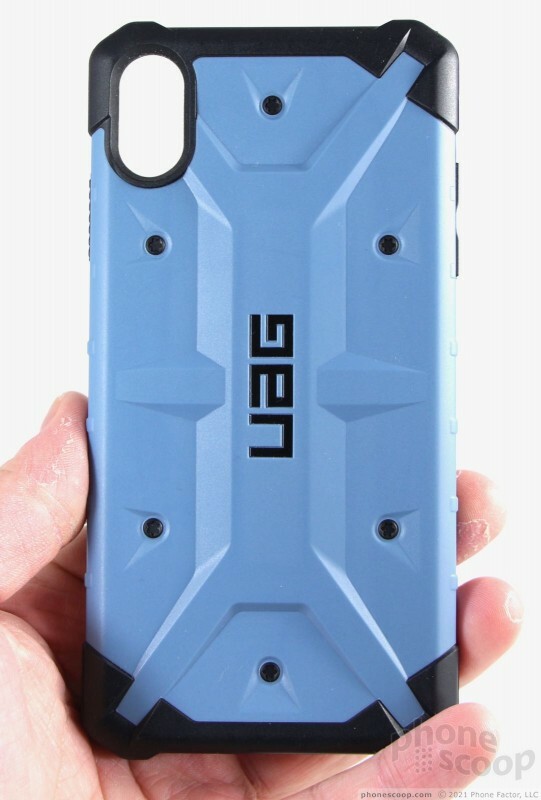 UAG has been protecting phones for years. The company primarily focuses on function more than form, though its collection of cases now includes some sleeker designs. 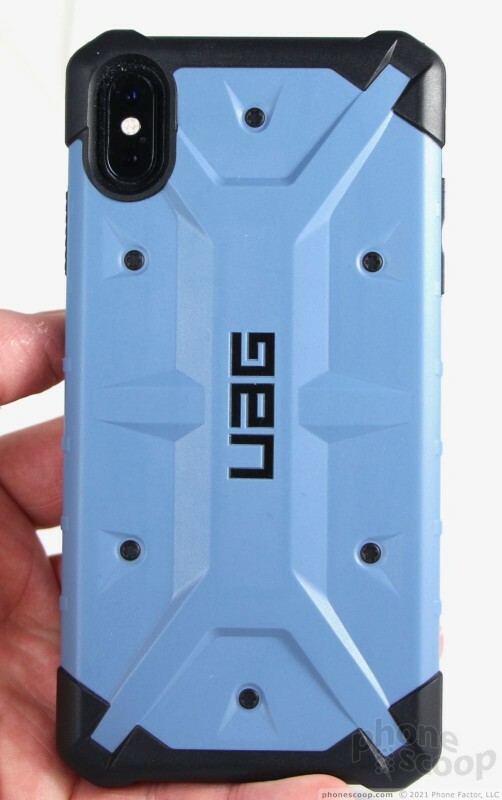 UAG rolled out a wide variety of options for the Apple iPhone Xs and Xs Max. 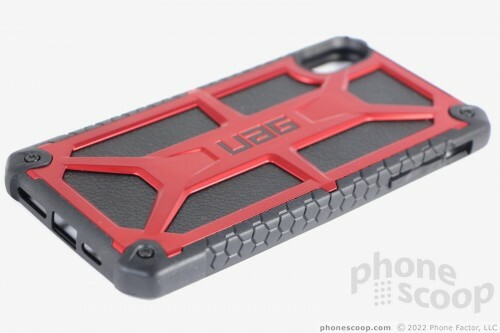 Phone Scoop put several of UAG's new iPhone cases to the test to see if they get the job done. The Plyo is the simplest case I've seen from UAG, at least as far as outward appearances are concerned. It's a straightforward, semi-transparent silicone affair that comes in a handful of colors. 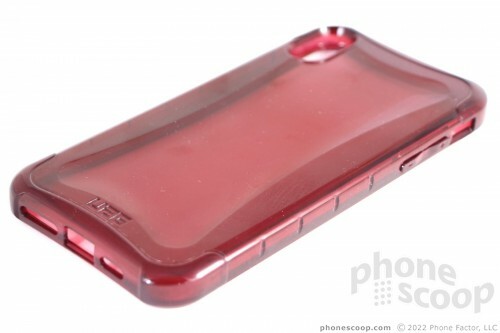 This case features a pliable, rubber-like frame that's firmed up by a rigid plastic rear panel. 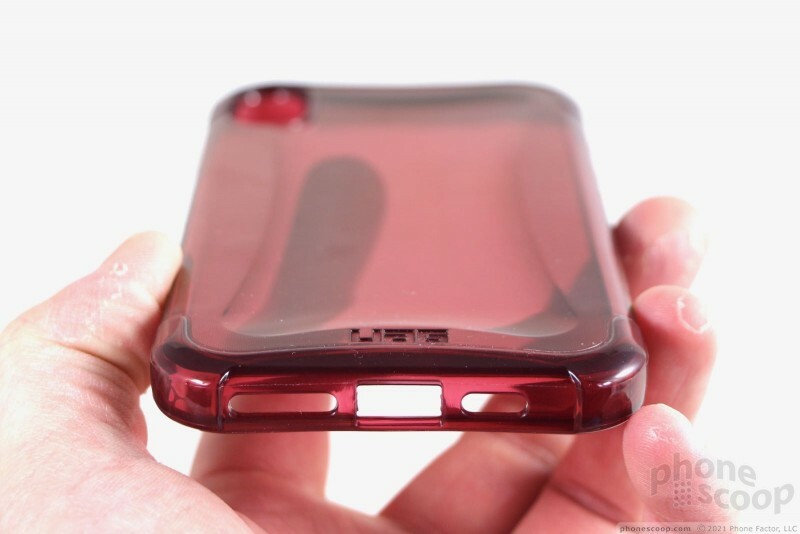 The top and bottom edges of the case are where the frame is the most flexible, while the side edges are more firm. The back of the case has some minor shaping so it doesn't look flat and boring. The corners are reinforced with some extra rubber. The Plyo is available in blue (Glacier), dark gray (Ash), light gray (Ice), and red (Crimson). You'll need to press your iPhone XS Max into the Plyo firmly to seat it properly. 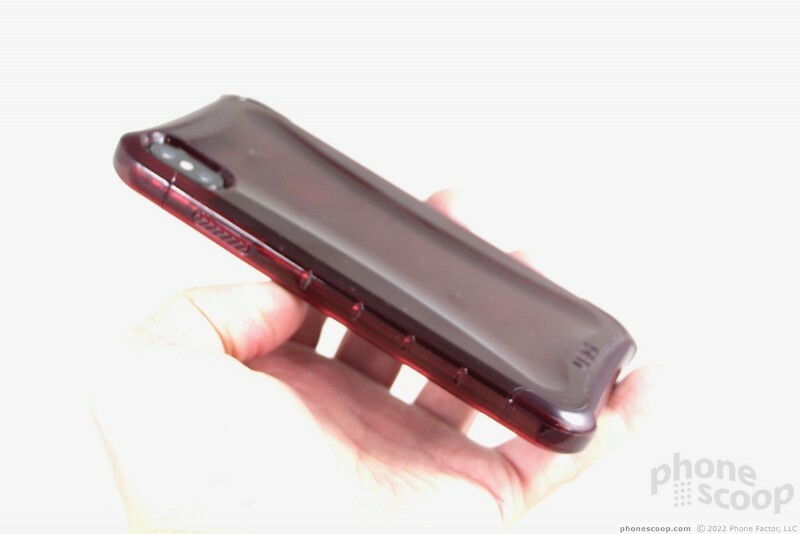 It takes real effort to snap the Xs Max into place, and far more effort to extract the Xs Max from the case. In fact, I worried I'd crack the phone while removing it from the case; that's how hard you have to pull. The semi-transparent material is smooth along the side edges with a few slits cut into it for grip-ability. A fine ribbed texture crosses both the inside and outside of the rear panel. It's the type of texture that sounds like a zipper if you drag your fingernail across it. This also helps provide some grip when the phone is in your hand. I like that the Plyo is about as compact as a case can get. 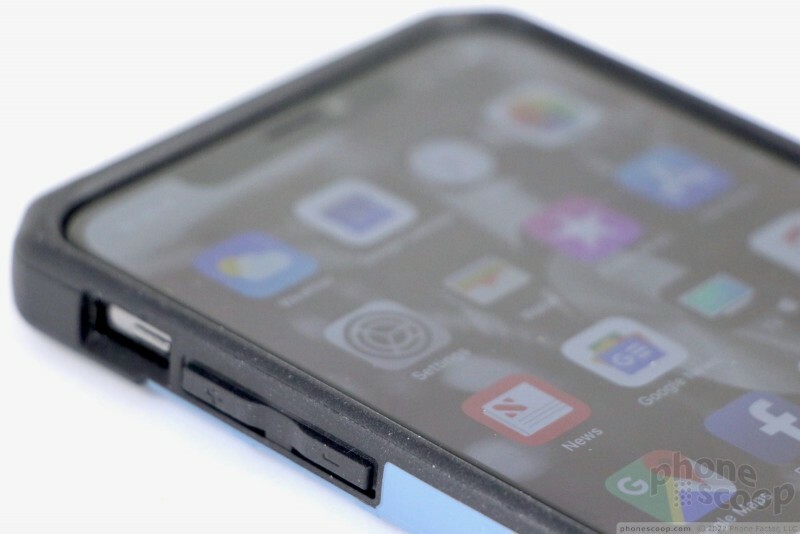 It hugs the Xs Max tightly and adds little bulk to the overall footprint. The Plyo doesn't get in the way of usability with one exception: the ringer switch. The switch is buried in a cavity that's a little too deep. You really have to dig your nail into the opening to flip the switch one way or the other. 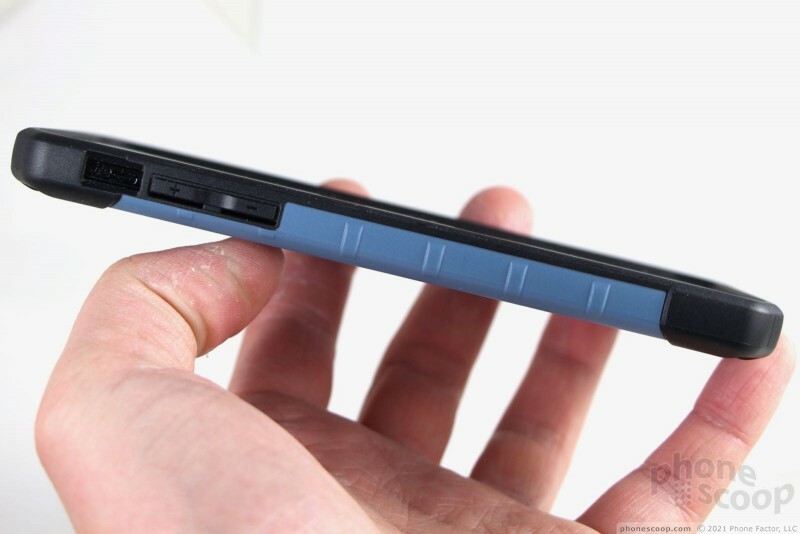 The rest of the phone's buttons are easy to find and use thanks to well-defined covers. 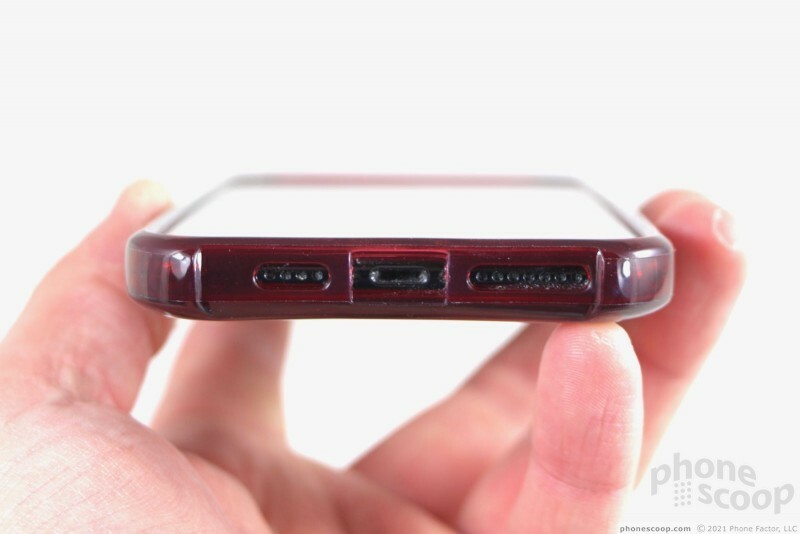 The requisite openings are carved into the bottom edge to accommodate the Lightning port and speakers, as well as the rear for the camera module. The case doesn't get in the way of wireless charging. 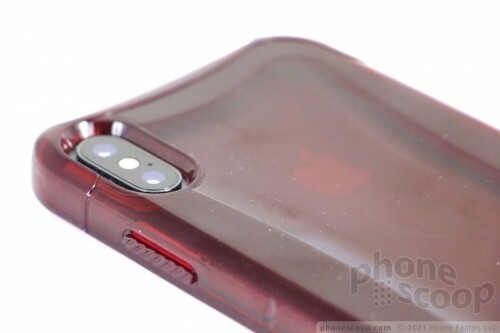 How well does it protect the Xs Max? The "airsoft" corners truly help cushion them from impacts, while the armor shell and pliable core disperse energy from drops. The case meets mil-spec 810G 516.6 for drops and shock. That means it's pretty tough. 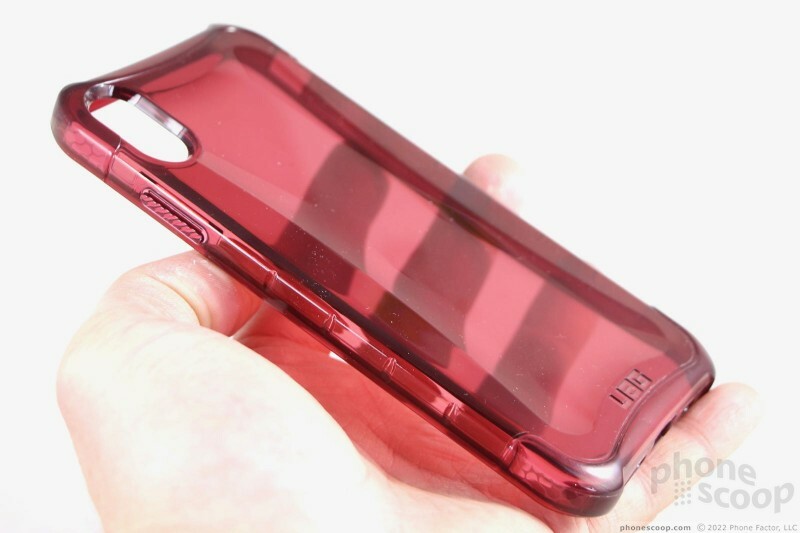 The case also forms a rim that surrounds the screen and keeps it safe from scratches when placed face down. The Plyo is strong and goes a good job. The one thing the Plyo lacks is style. 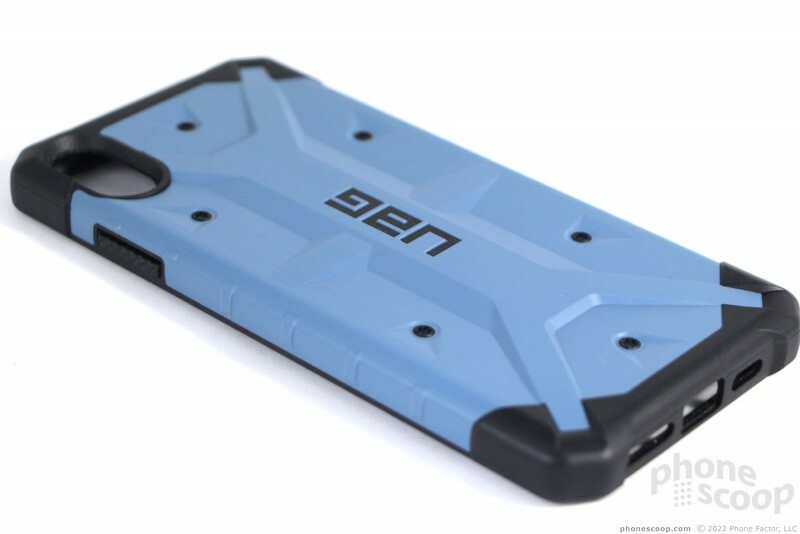 I don't mind the colors, but the overall appearance is a bit simplistic when compared to cases from Speck, Tech21, and Catalyst. The Plyo costs $40, which is a reasonable sum. Surely the $40 spent on the case is less than a screen repair from Apple. If you want simple protection, the Plyo provides plenty of it. The Pathfinder is a newer style from UAG. 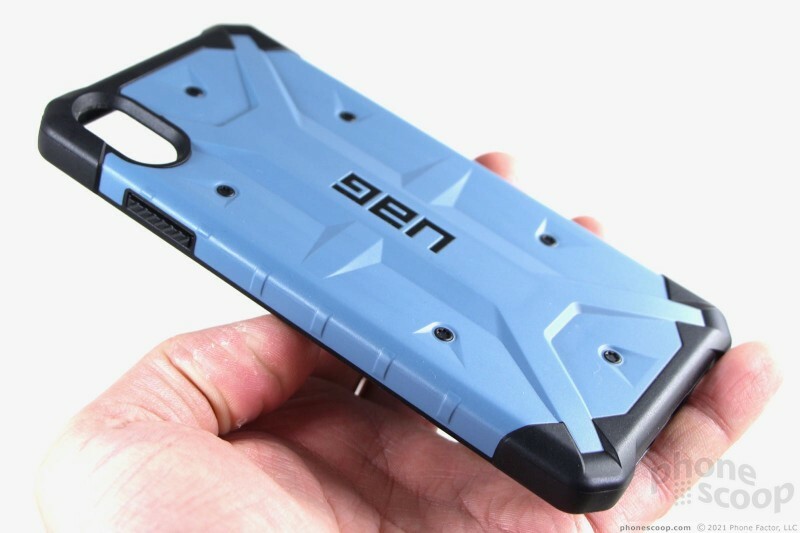 It blends elements of the Plasma and Monarch cases to create a masculine-looking shell that could be straight out of Blade Runner. It's more an ode to the Pathfinder Mars rover than it is the Pathfinder SUV. Pathfinder has two components: a black frame made of heavy duty plastic, and a colored panel that provides visual pop and plated protection. 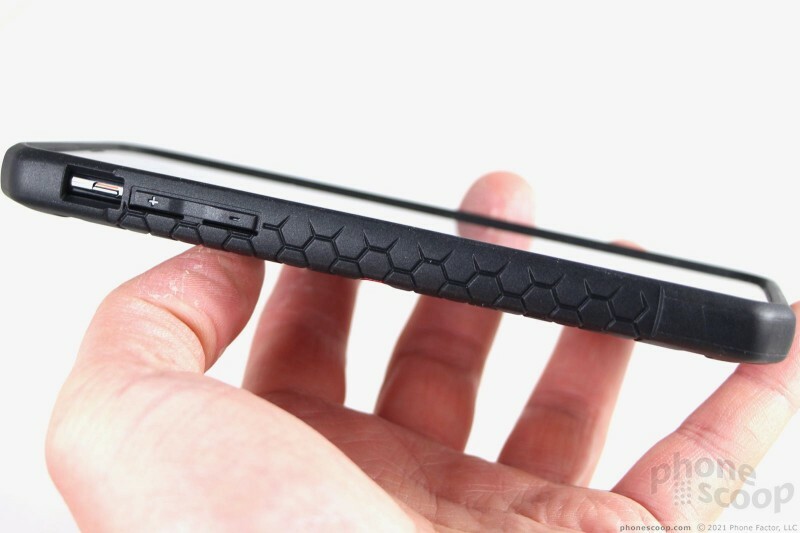 Along the top and bottom edges you'll find flexible rubber and reinforced corners to prevent shock. This heavy duty rubber also forms a rim around the camera array. 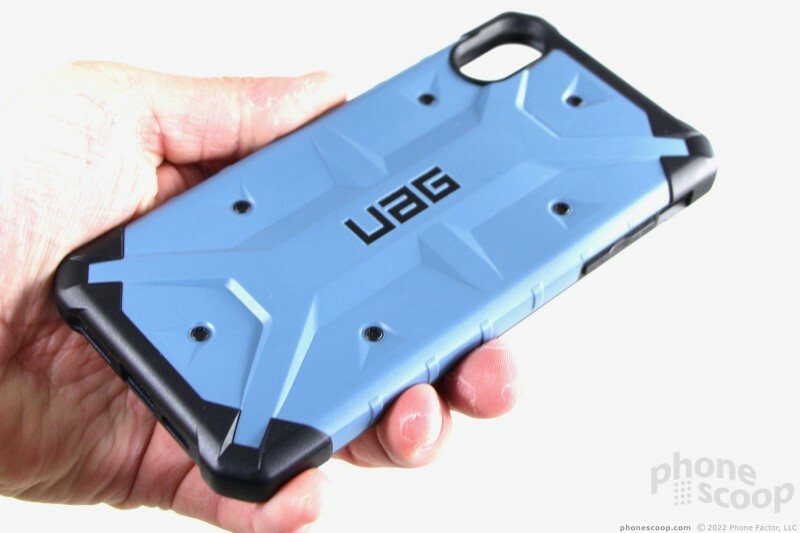 The firmer plastic panel covers most of the rear and side edges, and has what I'd call the signature UAG design (see photos). 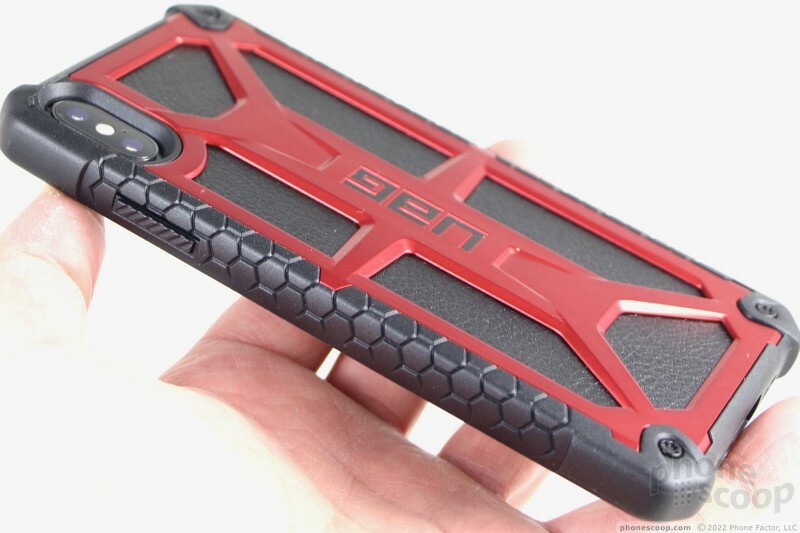 Hexagons are printed on the inner surface of the case, providing a tiny bit of cushioning. There aren't any ribs or bumpers along the inner walls. 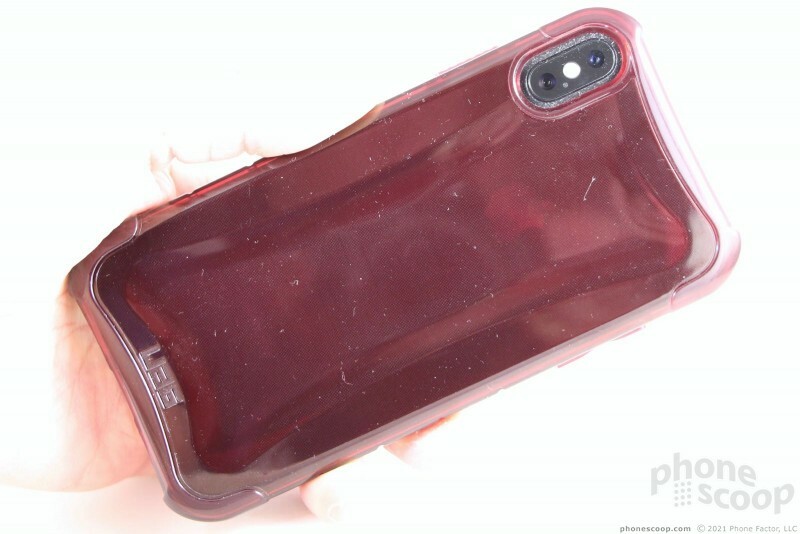 Five black dots are distinctly visible on the back of the case. These dots are rubber plugs that go all the way through the case and provide cushioning on both the inside and outside of the case. The plugs are flat on the inside, but have a tiny hex-bolt shape on the outside. 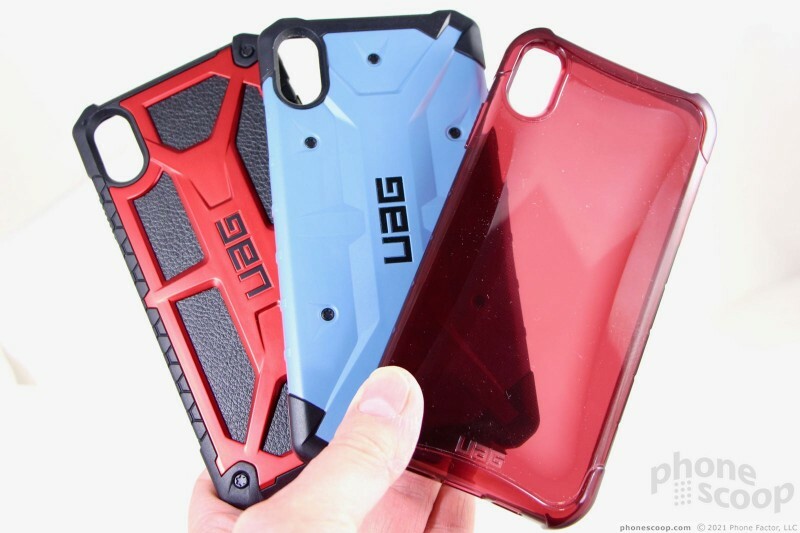 The case comes in black, white, red (Carmine), and blue (Slate). The Xs Max slips into the Pathfinder easily. This case is far more user-friendly than the Plyo. It's no trouble to install or remove. The Pathfinder does increase the Xs Max's footprint and weight more than the Plyo, but not by much. The Xs Max still fits in your pocket when it's wearing the Pathfinder. 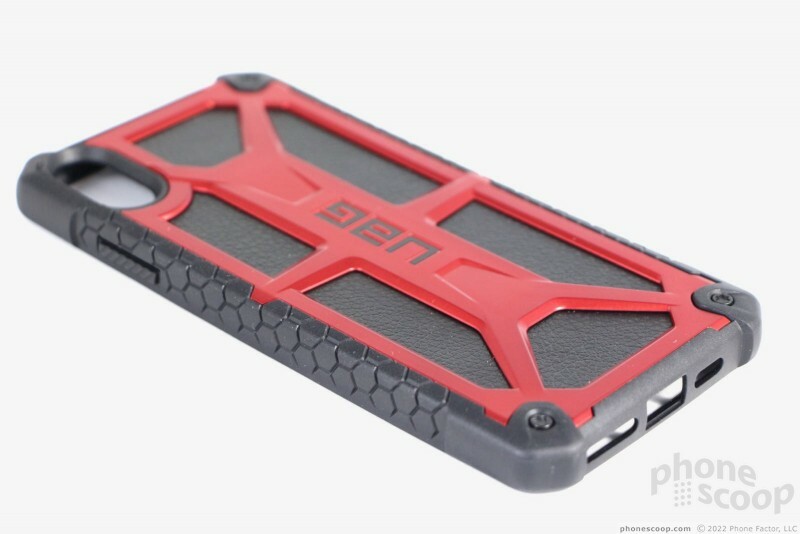 Since the case's texture is mostly smooth, it it easy to retrieve in a hurry. You'll have no problem using the buttons and ports. 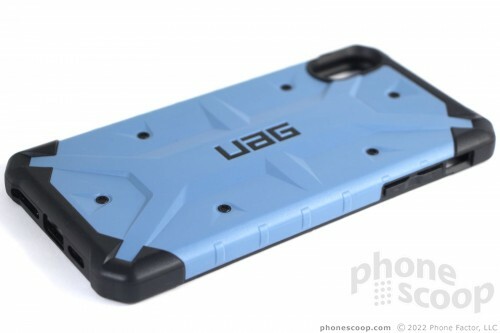 UAG made large and obvious covers for the volume buttons on the left and screen lock button on the right. 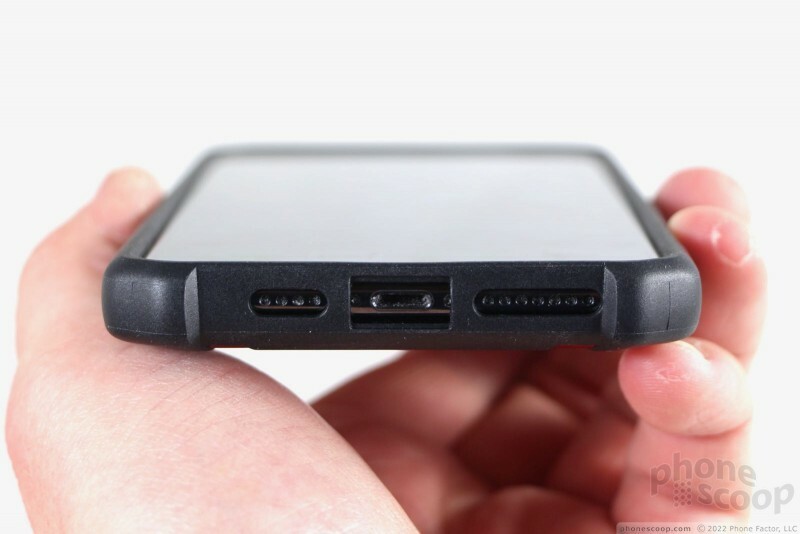 Huge cutouts on the bottom of the phone leave plenty of room for the Lightning port and the speakerphone. The case doesn't impede wireless charging. 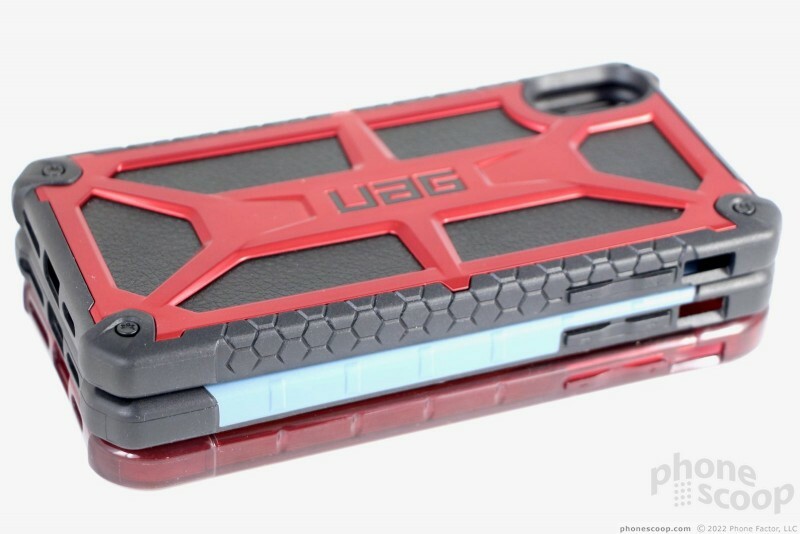 Like the Plyo, UAG says the Pathfinder is rated to mil-spec 810G for protection against drops and shock. 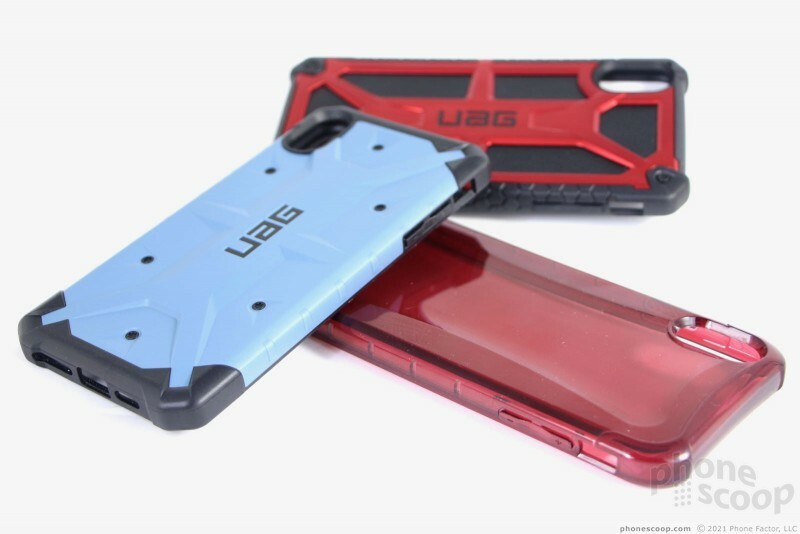 UAG doesn't make any specific claims about how far it can fall without sustaining damage. This case does a fine job protecting against what I consider "normal" drops during use. You should be all right if you fumble it running through an airport or jumping out of a cab. 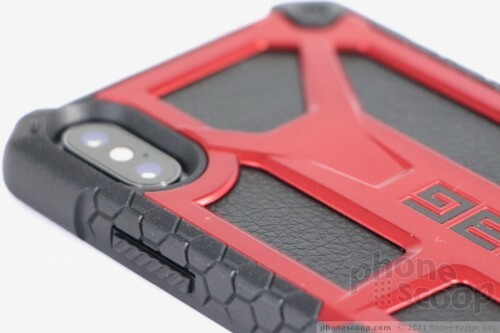 The top and bottom edges of the case form bulges that allow you to place the phone face down on a flat surface without damaging the display. 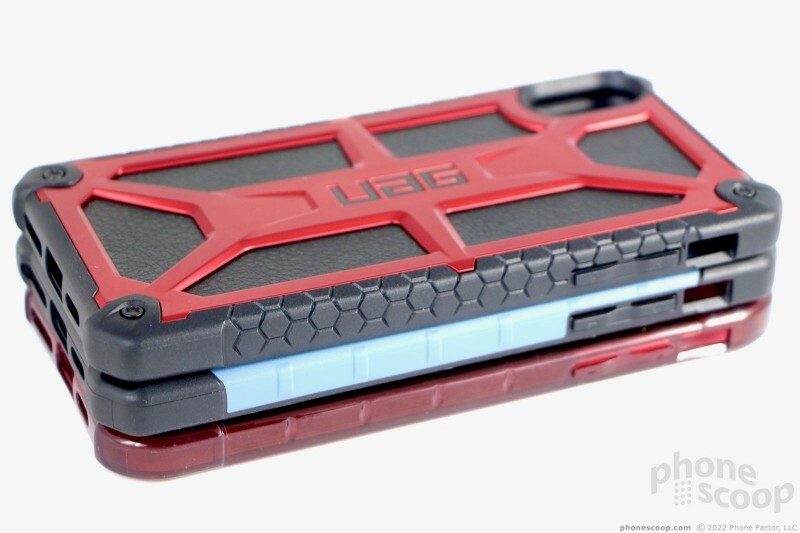 UAG sells the Pathfinder Series cases for $40. I like the futuristic looks, minimal profile, ease-of-use, and protection provided at this price point. 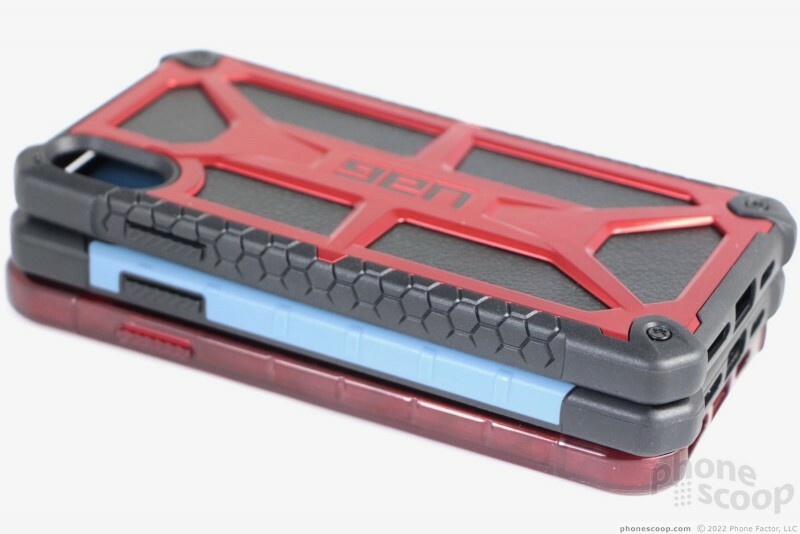 The Monarch Series is the most protective case UAG makes. It includes five layers of protection against drops, bumps, scrapes, and spills. The Monarch shares its basic appearance with the Pathfinder, but adds metal and leather to the mix. It's more Motley Crue or Metallica, than Maroon 5 or Mumford & Sons. It would look perfectly at home strapped onto the handlebars of a Harley. The patterned rubber, leather, exposed screws, and metal-colored supports give the Monarch a tough guy look that you'll either love or hate. The inner lining of the shell is a hardened plastic material. It has a faint diamond pattern across most of the flat section, but smooths out along the inner top and inner side edges. 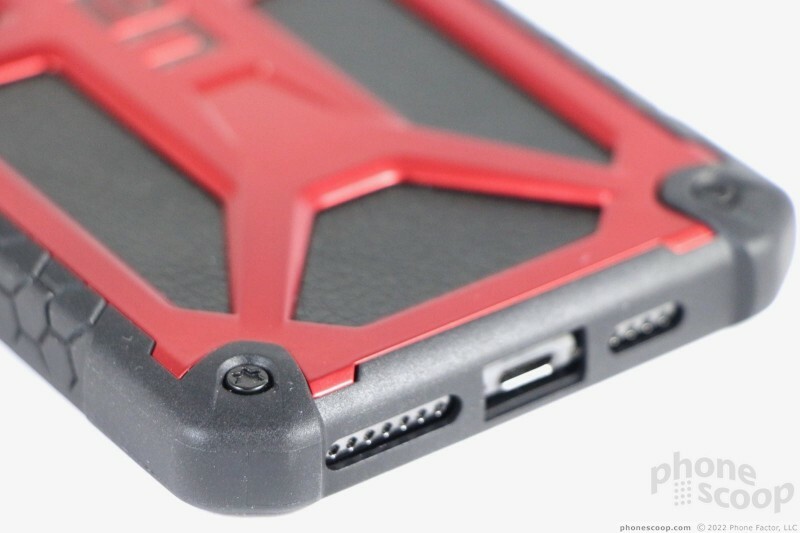 The inner lining merges with the rubber sides of the phone, which are are thicker than those of the Pathfinder case. 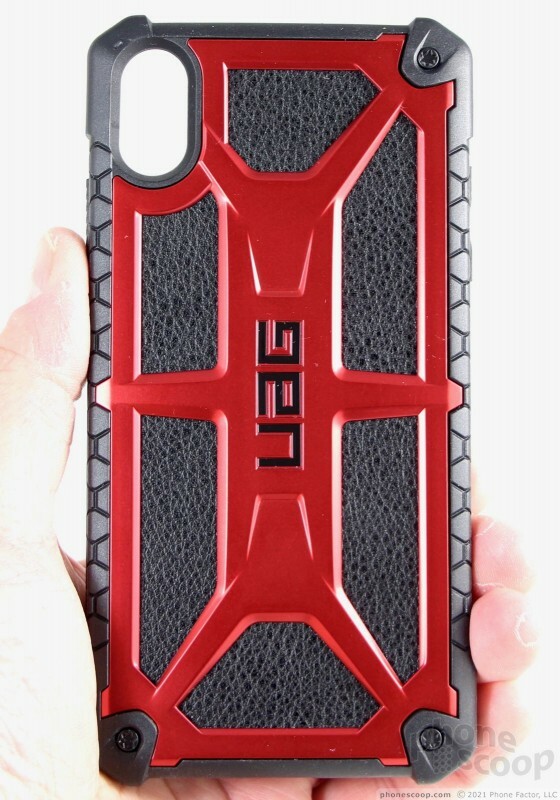 The outer sides of the edges have their own hexagonal pattern for aiding grip. 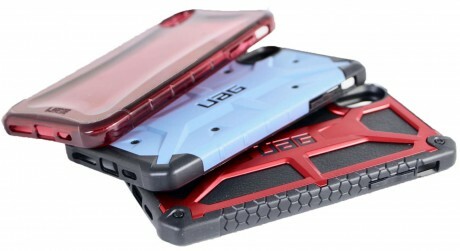 A skeleton-like frame forms much of the rear surface and gives UAG cases much of their personality. It's raised with skyscraper-like beams going this way and that. Patterned leather fills the gaps in the frame, providing a dash of rebellion to the case. Three rubber screws tie it all together. 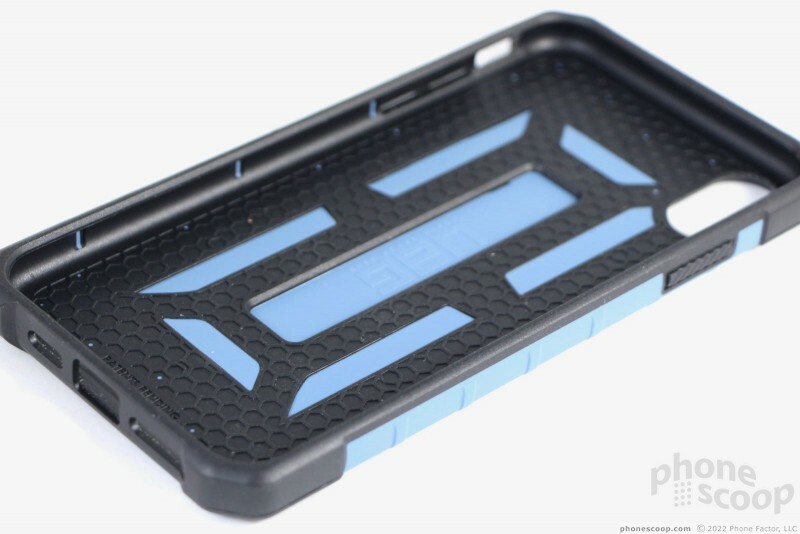 The experience of using the case is more or less identical to that of the Pathfinder. 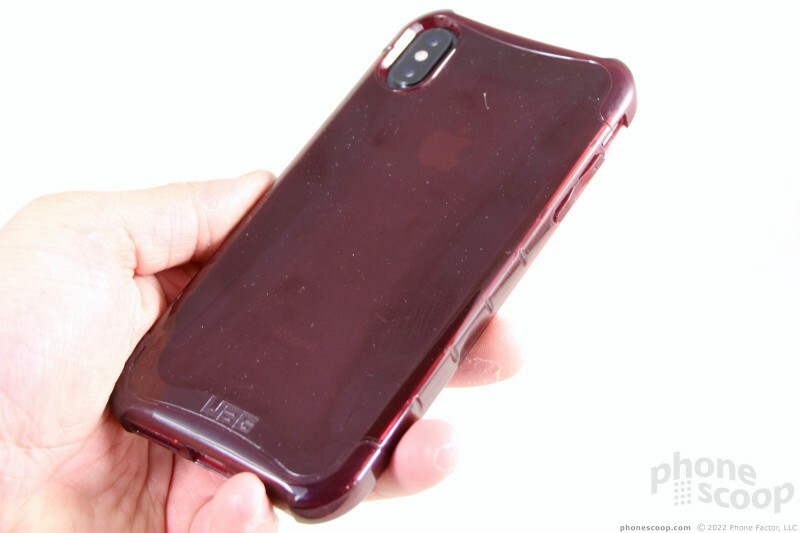 The iPhone Xs Max fits into the Monarch with minimal effort thanks to the pliability of the outer rim. The Monarch is hardly any thicker or heavier than the Pathfinder, but still comes across as more robust. You can stuff the phone into your pockets easily, but the rubber edges are more likely to get caught up in your jeans' pocket liner. The Monarch has the same openings for the Lightning port and camera, and the same rubber-coated buttons as the Pathfinder. Everything on the phone works as it should. I didn't have any trouble using the buttons or ringer switch. As expected, you can charge your iPhone wirelessly even while it's protected by the Monarch. UAG's marketing materials suggest the Monarch exceeds the mil-spec 810G rating by a factor of two. 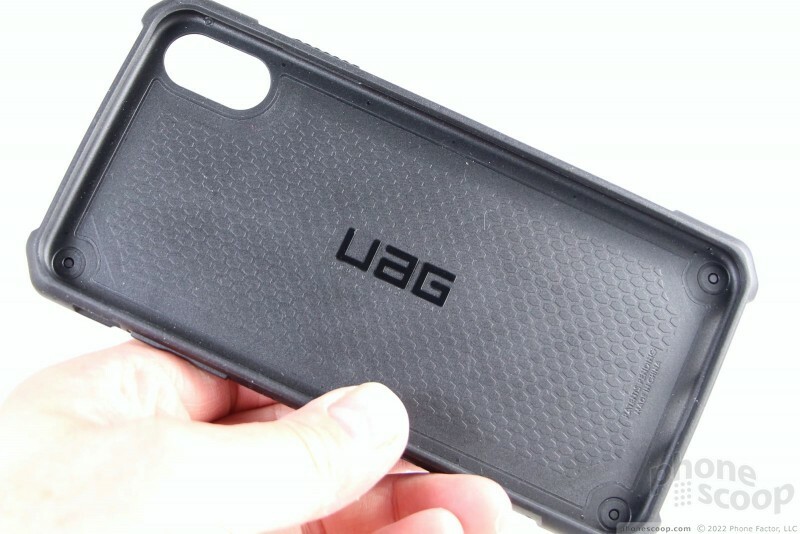 In fact, UAG is offering Monarch owners a 10-year warranty on the case (not the phone), something it doesn't do for its other cases. 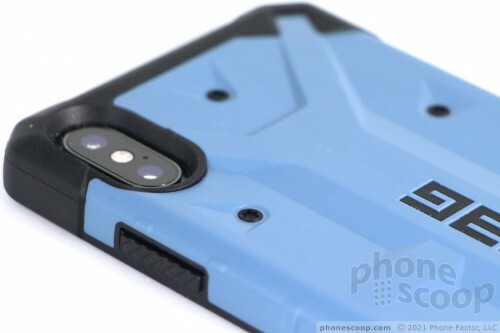 The Monarch will outlast the iPhone Xs Max by years. I performed some drop tests on various surfaces and can report that the Monarch provided plenty of protection. 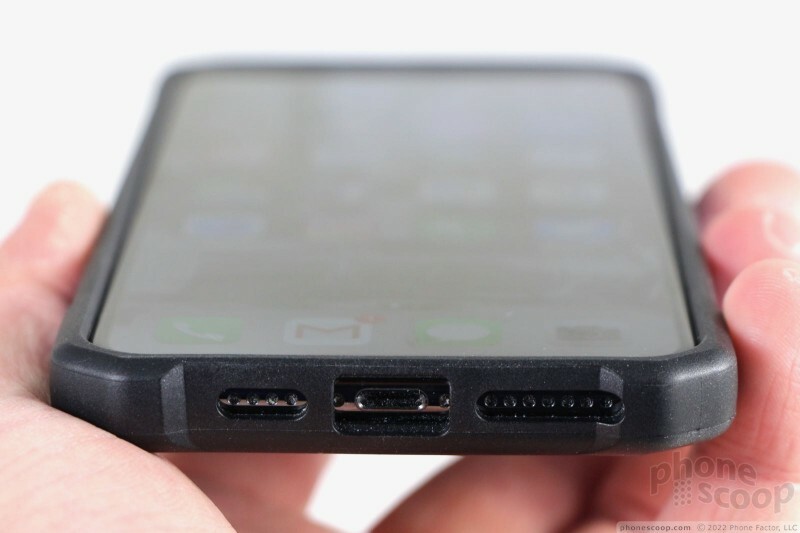 The Xs Max doesn't have a mark on it, thanks to the case. The thick top and bottom edges of the Monarch form hefty bulges. As expected, these make it possible to place the phone face down on a flat surface without worry. The Monarch Series costs more than the Plyo or Pathfinder at a rich $60. This case does provide more protection and flair than the others, but I'm not sure it's worth the extra $20. This fall Apple debuted its biggest-ever iPhone, the Xs Max. This phone boasts a 6.5-inch screen, Apple's A12 Bionic processor, dual rear cameras, wireless charging, a waterproof chassis, and Apple's new iOS 12 platform. Apple today provided some clarity on the arrival of more emoji for iOS devices. Earlier this year, the iPhone-maker committed to adopting more than 70 new emoji that are based in Unicode 11.